Proud of your work? 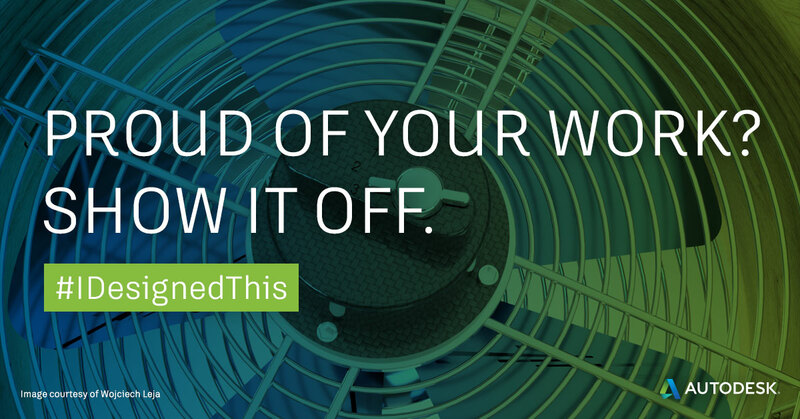 Show it off by tagging it with #IDesignedThis and sharing it with Autodesk on Twitter, Facebook, and Instagram. In your post, tell us all about your design: What problem were you trying to solve? Who did you design it for? What process did you use to develop it? What challenges did you face with your design? Good design comes from good research and process, and we want to hear about yours. Still want to share more? Build out your portfolio on Design Academy to tell a deeper story with your designs. Upload your sketches, images, and project files to highlight your design process and get noticed for your work. For inspiration, check out Karam Baki’s portfolio of futuristic skyscrapers and BIM models, or Furkan Günal’s conceptual product designs. Follow, recommend, and comment on the portfolios you like to connect with your peers and start to build your own following. You never know, you could be selected to be featured in a Student Highlight one day! Autodesk Education provides free access to industry-standard professional 3D design software and learning content to students, educators, and schools worldwide. We are committed to equipping you with tools and resources to help you achieve academic and future career success.